I will ensure that clear information is provided about my services and contact arrangements and I will respond to inquiries as quickly as possible. I will keep my skills and knowledge up to date and will use care when applying those skills. I will not shoe or trim any animal in your absence or in the absence of a caretaker, without prior arrangement. I will treat all horses humanely and with respect, with their welfare as the primary consideration and will not employ any means excessive restraint or discipline. I will not work with an animal if I feel that the conditions (i.e. 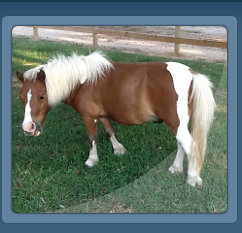 present temperament of the horse or present condition the horse is kept in) are unfavorable to a successful outcome. I will advise when I feel a second opinion or further professional advice is required and will not attempt to go outside of my area of expertise. In keeping with that statement, I will work in conjunction with veterinary advice where appropriate. 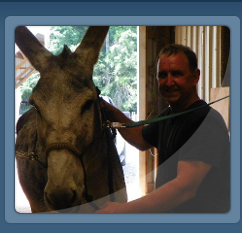 The farrier/client relationship is one of mutual trust and respect. I will absolutely maintain your confidentiality, treat you with respect, and observe all professional courtesies. I will give due consideration to your concerns and wishes where they do not conflict with the welfare of the horse. You do however, have the final say. 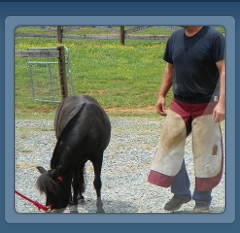 Farriers are not required to do so, but I am sometimes asked to catch, tie up and release the horse before or after trimming and shoeing. If I accept these additional risks, I will perform them with all due skill and care. Ample notice in booking and cancelling an appointment. A clean and dry workspace with adequate lighting and a non-slip surface. The shoeing area should be safe for horse and farrier. This would include protection from rain, wind and bad weather. A secure and safe ring to which the horse can be tied. A properly fitted halter with a good rope of adequate length. If the horse is not used to being handled, please have someone available to assist with holding. Also, if possible, provide a companion animal to remain close. 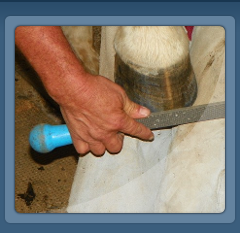 If possible, keep the horse shod or trimmed on a regular basis of 6 – 8 weeks.